Please note, frozen lakes are extremely dangerous and ice thickness is not monitored. Our recommendation is to stay off the ice. Should you choose to proceed onto the lake, this is at your own risk. If you would like more information on the dangers of ice, please visit: Canadian Red Cross: Ice Safety. Due to snow levels, the park gate is now closed for the winter season. Winter storms have caused significant washouts on both trails. Route finding may be challenging in some areas. Mountain Biking is not possible on the trails at this time. Please exercise caution when using the trails. Birkenhead Lake Provincial Park offers volunteer host opportunities. Birkenhead Lake Provincial Park was first established in 1963 to provide lakeside camping and other recreation experiences for travellers between Whistler and Lillooet. The park was expanded in 1996 from 3,642 hectares to 9,755 hectares, adding significant conservation values of the Sockeye Creek watershed. The park was again expanded by 684 hectares in 2008 to include more of the alpine headwaters of the western side of the Sockeye Creek watershed. The park protects important habitat for a variety of wildlife, including spotted owls, mountain goats, black bears and grizzly bears. 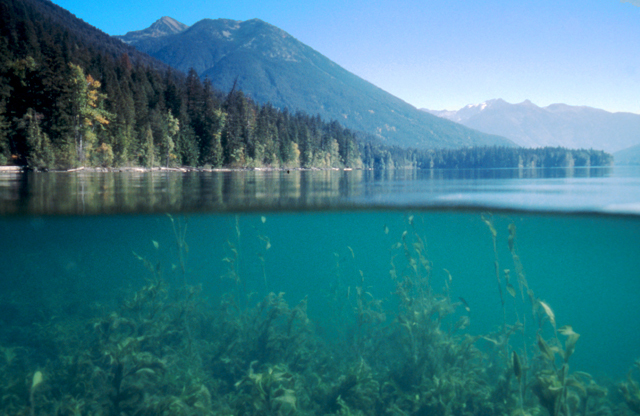 Old growth forests, subalpine and alpine environments, large and small lakes all contribute to the park’s diversity. Bears are very active in this park. Please read the bear safety information. Music, generators, etc. must be shut off completely between these hours. Located 22 km West of D’Arcy. 90 km North of Whistler, 145 km North of Squamish. Take Highway 99 from Pemberton northeast to Mt. Currie, turn off Highway 99 to D’Arcy. Just before D’Arcy (about 50km from Mt. Currie) there are highway signs indicating a turn off on to a gravel road that leads to Birkenhead Lake. From there it is a 17 km drive along a gravel road. The nearest communities, towns and cities are D’arcy, Pemberton and Mt Currie. Canoes and kayaks are welcome but be aware of strong winds which can blow up suddenly on the lake. There are no developed, boat accessible campsites on the lake. Daily and hourly canoe rentals are available on site. For more details, please contact the park operator. Bicycles must keep to roadways and designated mountain bike trails. Birkenhead Lake Trail: The 8-kilometre gravel trail to Birkenhead Lake Estates at the south end of the lake joins up with Birkenhead Road and Tenas Valley logging road. This trail is used by both hikers and cyclists. Caution: There may also be horseback riding on the west half of the Birkenhead Lake trail up to Sockeye Creek. Good fishing for Kokanee and Rainbow Trout. There are no Dolly Varden in Birkenhead Lake. Please note: fishing regulations require anglers to release all Bull Trout caught. Bull Trout are on the endangered species list. Some anglers have mistaken the Bull Trout species for a Dolly Varden. Since the Bull Trout species has suffered, there is currently a recovery program in place and the park is requesting the public's assistance. Anyone fishing or angling in British Columbia must have an appropriate licence. Caution: The lakeside Wilderness Trail and the Birkenhead Lake Trail: approximately 1.0 km from the trail head at the parking lot, both of these trails cross a 50 metre section of a rock debris avalanche path. Trail users must use caution when crossing over loose rock rubble and may be required to ford the stream. Crossings should be avoided during periods of prolonged, heavy rain. Wilderness Trail: A 2-kilometre hiking trail through old growth forest leads to a flat, treed area with views of the mountains across the lake and views back of the day use area beaches. A short section connects with the Birkenhead Lake Trail, allowing for a longer hike or a loop back to the trailhead. Birkenhead Lake Trail: The 8-kilometre trail to Birkenhead Lake Estates at the south end of the lake joins up with Birkenhead Road and Tenas Valley logging road. This trail is used by both hikers and cyclists. There may also be horseback riding on the west half of the Birkenhead Lake trail up to Sockeye Creek. Motorized vehicles are not permitted on this trail. Goat Lookout Trail: This 1-kilometre trail on the south side of the valley is a bit rough and steep in places, but offers a view of the lake at it’s end and in the spring and fall mountain goats may be seen on the cliffs above the campground. Cautionary Note: During the spring snow melt (April - June), Phelix Creek water levels rise and may crest the log bridge approximately 100 metres from the start of the trail. High water conditions may require temporary seasonal closure of the trail. Best you otherwise hike the trail in the mornings during May and June. Pets/domestic animals must be on a leash at all times and are not allowed in beach areas or park buildings. However, there is one designated open area at the far end of the day-use area for dogs. You are responsible for their behaviour and must dispose of their excrement. Backcountry areas are not suitable for dogs or other pets due to wildlife issues and the potential for problems with bears. There is a sandy beach and swimming is available in this cold water lake (August is usually the warmest water month). Please stay within the swimming area identified by the marker buoys. There are currently no swimming floats. There are no lifeguards on duty at provincial parks. There is no viewing platform but mountain goats can be seen in the spring on the high cliffs to the north, above the day use area and campground. During the winter season, the 2km road from the park gate to the lake is good for cross-country skiing and snowshoeing. There is a concrete double-wide boat launch available in the day-use area at this park. Vehicle and trailer parking is available overnight. A floating dock is next to the boat launch. Boats can be left in the water (tie-up space is limited on the dock) or beached overnight at the owners own risk. There is no nearby marina to moor boats. Waterskiing on the lake is not recommended. A pressurized, treated water system is now available. Potable water is available at taps in the main campground, the high density campground and the sani-station. There is a day-use/picnicking area with picnic tables and parking area. Some of the picnic tables have barbeque attachments; bring your own briquettes. There are no fire pits in the day-use area and open fires are not permitted. There is a sandy beach. There are no phones in the park. A pay telephone is located at D’Arcy, 22 km (13 miles) away on Portage Road. Pit toilets are available in both the day-use and campground areas. No flush toilets at this park. This park offers vehicle accessible campsites, 7 of which are double sites. There are no pull through sites. There is room for a maximum of 2 vehicles per site (extra vehicle fee applies). No extra parking is available. There is no gatehouse. There is a locked gate in the off season, generally from late October to early May, however you may still hike in and camp. There are no facilities or services available, and no fees, in the off season. A sani-station is available and operational only during the full service camping season. If there is no staff available to direct you to a site, check the reservation board at the park entrance, then choose a site with no reservation or camping receipt posted at the campsite. Staff will come around to collect fees. The closest store is D’Arcy approximately 22 kilometres on the Pemberton Portage Road. The nearest pay phone is also in D’Arcy. Campsite reservations are accepted and first-come, first-served sites are also available. There are no developed walk-in or boat-in wilderness campsites in this park. There is a wheelchair accessible gravel trail located near the beach. There are no toilets or campsites that are wheelchair accessible.